We hope this page will answer the questions you may have about dental implants. The answers given here are general in nature. For advice concerning your specific condition, you may take advantage of our complimentary consultation with Dr. Khazian. IS IMPLANT DENTISTRY A SPECIALTY? WHO DOES IT? HOW DO I TAKE CARE OF MY DENTAL IMPLANT TEETH? Esthetically, dental implants support teeth that look like real teeth. Functionally, dental implants feel and act like real teeth. With dental implants, you can eat and chew again without pain or irritation. Foods that were forbidden are now included in the diet. Bulky dentures cover large surfaces of the mouth, including the palate. This diminishes the sense of taste and the individual’s ability to taste is compromised. Dental implants eliminates the need for bulky dentures and allow the individual to taste the food as in natural teeth. Anyone who is missing one or more teeth due to injury, disease or decay may be a candidate for dental implants. Implant patients can be in their early teens or be mature adults up to 80-90 years or older. You are never too old to have dental implants. Good health and adequate bone are the most critical factors in evaluating dental implant candidates. If you are loosing any of your teeth, make sure you consider dental implants as your best option, and remember: the best time to place an implant may be at the time of tooth extraction and not later. Occasionally, older patients express concern that their age may prevent them from enjoying the benefits of dental implants. However, health is more of a determining factor than age. If you are healthy enough to have a tooth extraction, you are probably healthy to receive dental implants. Certain chronic diseases may contraindicate implant treatment. Dr. Khazian carefully evaluates your dental and health history to determine if you are a candidate for dental implants. No, implant dentistry is not a specialty. There is no such thing as implant specialist. However, a dentist doing implant surgery and related treatments should have proper training and education. Implants involve 2 phases of treatment, placement of implants and placement of crowns or restoration. Most dentists perform only the restorative aspect, while others do the surgical phase. This requires detailed communication and coordination, and may result in confusion for patient, as well as both doctors. Dr. Khazian at Dental Implant Centers performs both surgical and restorative phases. This will give you a smoother treatment process, and faster and better results. During the past 10-15 years, dental Implantology has evolved into an advanced and predictable treatment modality. Today, dental implant surgeries are performed in a dental office operatory. 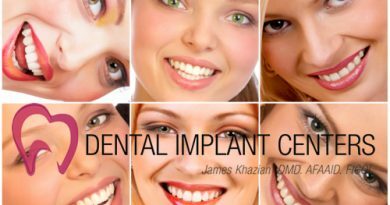 Dental Implant Centers offer the most advanced surgical techniques and the implant surgeries are performed under the most strict sterilization protocol. Using very accurate surgical techniques, implants are placed into dimensionally controlled sites (depth and width) in the jawbone. Traditionally, implants were left for healing for a period of 3-6 months to ensure a strong base. However, using innovative surgical techniques Dr. Khazian is often able to eliminate this waiting period. This means you can have the failing tooth extracted, implant placed, and restored with a tooth, all in one visit. Implants, as we know them today, have been in existence for at least twenty-five years. For the last ten years, however, implants have evolved into a predictable treatment modality for replacement of missing teeth. We at Dental Implant Centers have provided implant treatments for the past 18 years and we are proud to have established close to 100% success rate. Few forms of medical, orthopedic or dental treatment have such high success rates. Recent advances in implant dentistry enable us to place dental implants and immediately restore it with crowns or bridges. This means, you can replace your lost or missing tooth in just one visit. If the bone condition (quality and quantity) is not ideal, we provide the latest techniques to restore the jaw bone before placing implants and this might require more time. Treatment for such cases might take anywhere from 3-8 months. No, you will never be without teeth. We will make sure you have teeth all through the course of treatment. You will look and feel natural. Implant teeth look, feel, and function like your natural teeth. Esthetically, implant teeth are indistinguishable from your other natural teeth. Once the implant treatment is finished, the individual usually forgets having the implant in their mouth because it feels natural. Implants do not require special care. Your routine brushing and flossing will adequately maintain your implants. After your dental implant treatment is completed, you will be advised to have periodic office visits for a check-up and professional cleaning. Well maintained implant teeth will serve you for many years, possibly a life time. Using advanced surgical techniques and equipment, we have been able to minimize pain and discomfort. Our patients usually report minor or no pain after surgeries. We believe placing an implant is usually more comfortable than extracting a tooth. Yes, our anesthesiologist is available to provide you with general anesthesia if you so choose, however, most implant procedures are performed using local anesthesia with or without sedation. Your choice of anesthesia is discussed and determined during your initial visit and evaluation with Dr. Khazian. Read more on the Services Offered page. Dental implants look, feel, and function like natural teeth. By providing the healthiest and the most natural looking replacement for your missing or lost teeth, dental implants enhance the over all quality of your life. Because dental implants feel like natural teeth, patients forget they have missing teeth. Maintenance of facial bone. If you have failing teeth that should be removed, it is important to know that the best time to place dental implants may be at the time of tooth removal. Remember that the most critical consideration after losing a tooth is to maintain the integrity of jaw bone. This is possible only with dental implants. Like natural teeth, dental Implants, which are anchored in the jaw bone, are able to transmit chewing forces to the surrounding bone and stimulate bone remodeling (a natural biological process which constantly destroys old bone cells and replaces them with new cells). This process continues all through life, as long as natural teeth are present, and is responsible for maintaining the volume and density of jaw bones. However, it slows down sharply after tooth loss, and results in jaw bones shrinkage and collapse of facial structures. To learn more about consequences of bone loss, you may read Dr. Khazian’s article “FACIAL BONE LOSS AND PREMATURE AGING“. Improved chewing ability. Dental implants provide a solid and stable foundation for new teeth. Patients are able to eat without worrying about moving or loose dentures. Improved phonetics. By eliminating bulky, loose dentures, dental implants improve phonetics significantly. Dental implants feel like natural teeth and patients actually forget they have missing teeth. Improved psychological health.Having dental implants is like having a new set of natural teeth. With all the comfort of eating, talking, and socializing without the fear of embarrassment, the individual’s self image is tremendously enhanced. Improved esthetics. By preventing bone loss, often through bone repair and replacement, implant procedures significantly improve facial esthetics. Regained chewing awareness. With Dental implants, chewing forces are directly transmitted to the jawbone, helping patient’s chewing awareness. With dentures, the roof of the mouth (palate) and all gum surfaces are covered, preventing taste and chewing reception. Maintenance of muscles of chewing and facial expression. A sound, healthy bone structure is vital for intact overlying facial muscles. By preventing facial bone loss, dental implants maintain the integrity of facial muscles. Increased retention and stability of dentures. By using dental implants, loose, instable dentures can effectively be anchored to jawbone and provide stability and retention. From the replacement of a single missing tooth to extensive reconstruction and replacement of several or even all teeth. Dental Implant Centers offer the healthiest and most intelligent treatment solutions. We provide the most comprehensive treatments for dental implants in San Diego. Both surgical and restorative phases of your dental implant treatment are performed by Dr. Khazian. There will be no referral back and forth to another doctor or office. This means a more consistent, smoother, and faster dental implant treatment.